1 ACT Driving Schools Blog Posts - Read them today! As we already know, I love incorporating memes into my blog posts, so I felt as if this cartoon was quite fitting in a post about the new hands-free law. The Georgia Hands-Free Law (HB673) has been in effect for one month as of today! I figured that 1 ACT Driving Schools should do a piece on this law, since I have already witnessed many people blatantly breaking this law and staring at their phone while driving. Of course, I can’t always blame people for not knowing about the law, since it wasn’t publicized the way it should have been, but that’s neither here nor there. I believe that, as a driving school, it’s our job to provide people with important information like this for their safety. 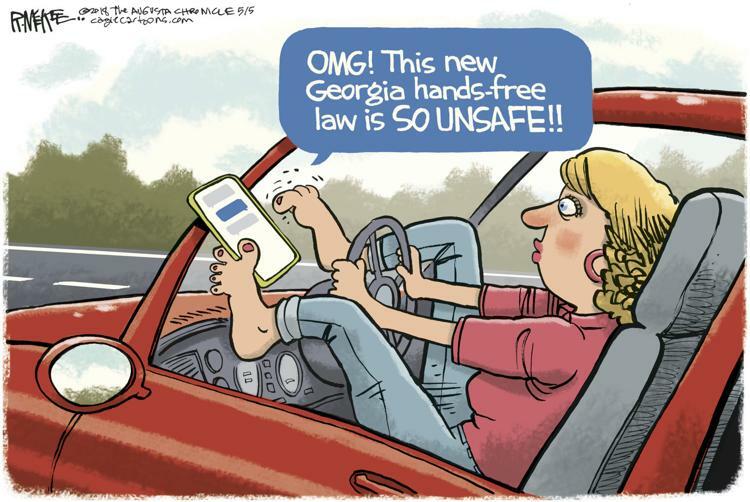 Drivers cannot have their phone in their hand or touching any part of their body while driving, not even using their feet as the cartoon suggests. The phone needs to be stuck up on a phone holder or off to the side, not in a hand or lap. I know this one may be hard for the people whose phones are permanently glued to their hands, but I can promise you that you'll live. Drivers cannot send text or read messages or check social media or any other apps while driving. Voice-to-text is permitted as long as the individual does not touch their phone to activate it. If you need to send a text, use your phone’s assistant (Siri, Bixby, OK Google, etc.) to send it instead of touching the screen of your phone. Drivers cannot use their phones to watch videos. GPS videos can be used, but the phone must be mounted and not in the driver’s hand. I know that it’s tempting to open the Snapchat your crush just sent you, but I promise that your crush isn’t worth literally dying over because you needed to open a video. Drivers cannot use their phones to record videos. Dash cams are allowed. This means that all of the drivers filming their friends doing the “In My Feelings Challenge” or recording themselves singing on Snapchat or Instagram are breaking the law just for trying to show off. Drivers cannot touch their phone to stream music on their phones. Many people have been confused about this one, thinking it means that they can’t stream music at all, but that’s not the case. You can still have your Apple Music or your Spotify running, but you can’t touch the phone while driving to change the song. My solution: queue up all of the songs you REALLY want to hear before putting your car in drive, and you won’t have to worry about changing the song! There are a few exceptions to the law, such as when the driver is reporting an emergency, when the driver is providing a utility service and is responding to an emergency, when the driver is a first responder on duty, or when the vehicle is parked. If you aren’t in the scope of one of these exceptions, you’re breaking the law (Heads Up Georgia). The 2nd and 3rd offense fines are only applicable if the driver has been convicted once within a 24 month period; after 24 months, only 1 point and a $50 fine will be incurred. First offenders can have their charges dropped by proving that they have obtained a hands-free device since being ticketed (GOHS). Contrary to popular belief, there is no 90-day grace period (Hands Free Georgia). The hands-free law went into effect immediately starting July 1, 2018, and has been enforced ever since. Over 1,000 tickets were written as of July 11th! In fact, Georgia state troopers wrote over 1,000 formal warnings and 320 citations alone by July 11th (AL.com). Georgia police officers are taking this law very seriously, as should we to avoid hurting others. One question remains: will this actually work, or will people just get more creative about using their phone while driving? Well, if we look at the statistics from other states with the same law, it seems as if this law will be VERY effective. Georgia is the 16th state to institute a hands-free law, and the other 15 states saw a 16% decrease in traffic fatalities within the first two years of the law’s institution. It will be interesting to take a look at Georgia’s statistics over the next two years to see the effect of the hands-free law, but I’m very sure I will see an decrease in traffic fatalities as well (Hands Free Georgia). I hope that you found this to be informative and helpful in understanding the hands-free law! Our hope is that we don’t have to meet anyone who got ticketed for breaking this law because people have the information and take the law seriously, but we’re all human and we all make mistakes, so breaking this law is bound to happen. We get it—we’re guilty of picking up our phones for a second too just to check the text message that just came in. That’s why we’re here to help you if you find yourself in a situation where you receive a ticket for this. By taking the defensive driving class, you can remove up to 7 points on your driver’s license every five years! For more information on the defensive driving class, click here. Of course, the 1 ACT Driving Schools recommendation is that drivers leave their phones off to the side while driving and avoid checking it. Think of it this way: you don’t want to have to pay $95 AND sit through a 6-hour class just to keep your license point-free. The easiest solution is to avoid touching the phone and just drive. Stay safe out there, and don’t forget to remain hands-free! This is an example of pacing, which is VERY inconsiderate to do on the roads! Think about it: you could end up in the other driver’s blind spot, causing an accident. I’ve made it a habit to slow down when someone is desperately trying to pass me because it’s safer for me, safer for them, and it’s just nice in general. People like this are the root of many traffic jams! This is a guy I KNOW none of us love. One of my general rules of thumb is not to get in front of a driver who is clearly driving faster than I am. It’s common courtesy and it’s safe, since you’re not forcing the driver to brake too quickly. When you’re checking your side mirrors, if you’re going to have to speed up to get in front of someone or you can see them going faster than you, just don’t pass them—don’t be this guy. 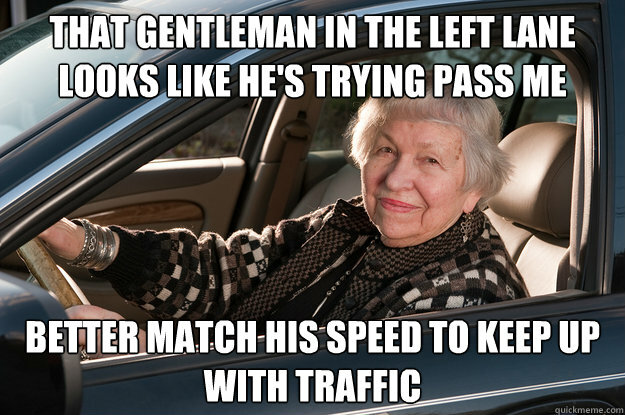 Like the lady in the previous meme, this guy is another cause of traffic jams daily. This image was captured in LA, but if it weren’t for the road sign, I would swear I was looking at good ol’ ATL. I can testify to the fact that it’s ALWAYS helpful to know back roads, because between hourly accidents and endless roadwork, you can NEVER predict Atlanta traffic patterns. I know back roads from every exit on my route to the office so I’m prepared for anything. Little life-hack for new ATLiens: know the city streets like the back of your hand, because Atlanta traffic is NEVER on your side. THIS is something we can all relate to! 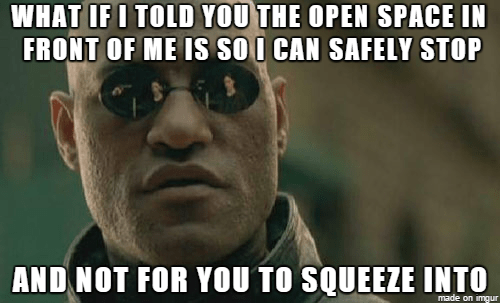 How many of you have ever been cut off by a driver trying to squeeze into that tiny spot in front of you? I know I have MANY times. Quite frankly, it’s unsafe and you shouldn’t do it. You always need to leave space in between your car and the car in front of you to prevent accidents. The fact presented in this meme is mind blowing to many! I’ll admit that I’m guilty of being on both sides of this, and I know many readers are as well. I’ve definitely given other drivers this look to let them know that their speeding up did nothing, and I’ve definitely endured feeling someone’s gaze on me after I’ve unsuccessfully beat traffic. 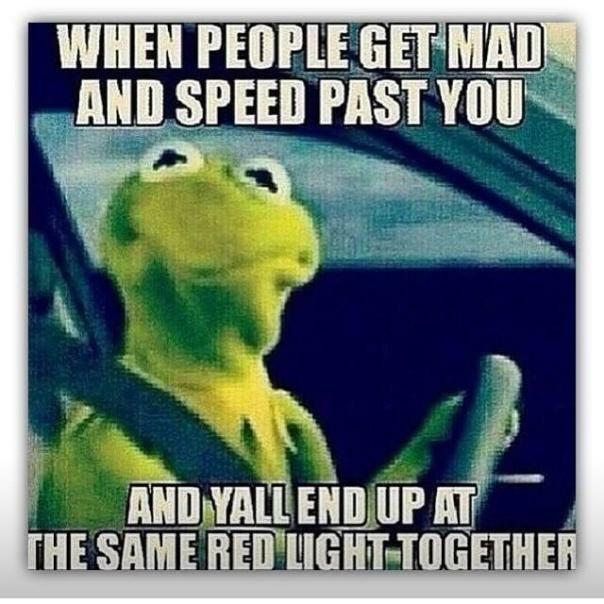 On the other hand, at least us wanna-be racecar drivers aren’t driving through red lights! 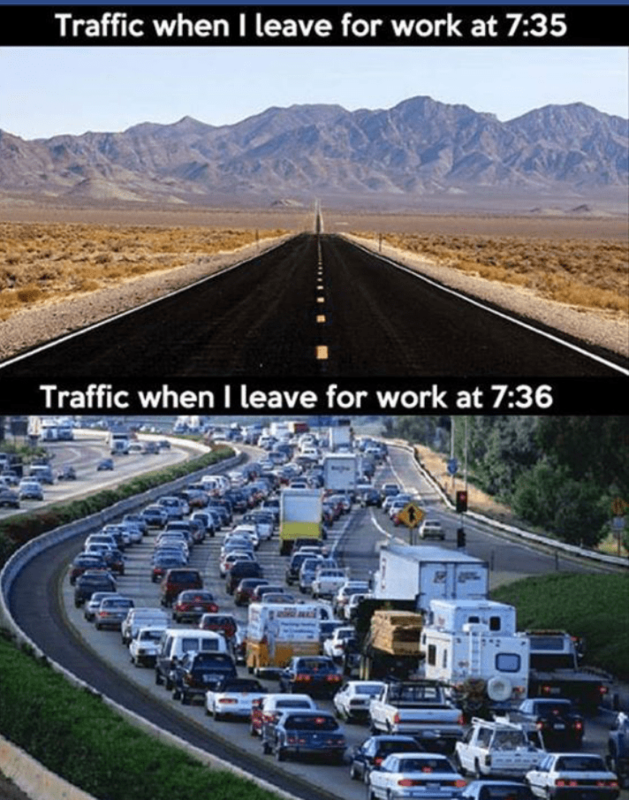 I take I-75 to I-285 to work every day, and every day I have to plan my morning commute down to the minute because this is my reality. I’m sure many of you can relate. You leave at one time and get to your destination in 30 minutes, but if you leave a minute later, you should expect your commute to be 55-60 minutes long altogether. At least we have apps like Waze to let us know what time we should leave in the morning to make commute-planning an easier task! 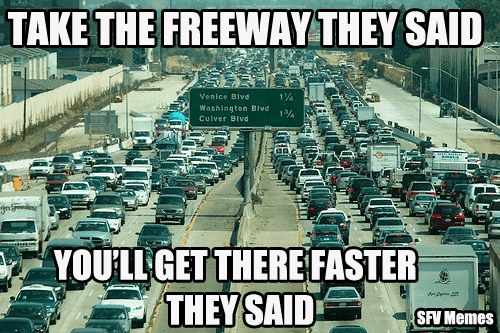 This is more of a cartoon than a meme, but since we live in Atlanta where the city feels as if it’s appropriate to do road work seven days a week at all hours, I felt that this was appropriate. I understand the need to build bridges and fix various areas of the interstate system that are falling apart. What I don’t understand why it took me over an hour to drive to the airport going from I-75 to I-285 at 11 am on a Saturday! 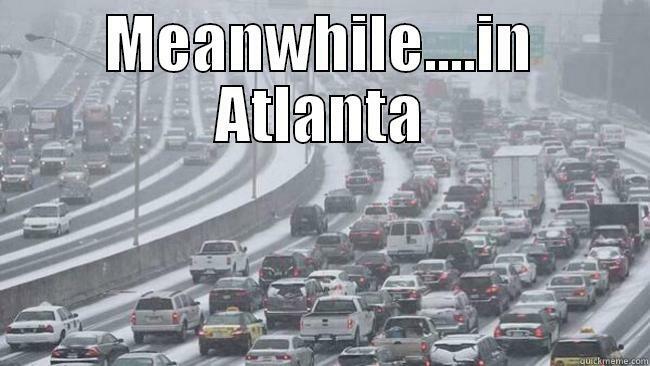 PLEASE do us Atlanta commuters a favor and give us the weekend off from our rush hour traffic. 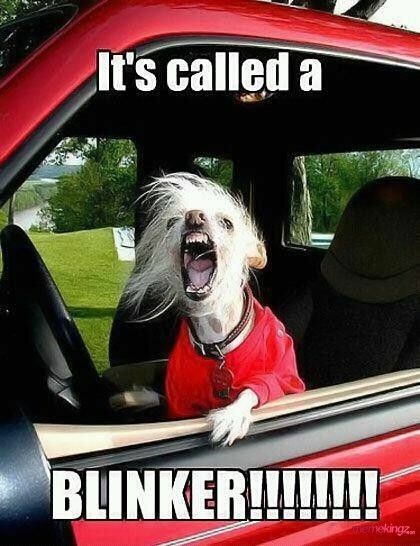 Here’s a rare, never-before-seen photo of your favorite office manager reacting to #1 on my list of the 10 Most Annoying Driving Habits: not using a turn signal (https://www.1statlantaduischool.com/10-annoying-driving-habits/). ALL YOU HAVE TO DO is flick your pinky up or down, and other drivers know where you’re trying to go. It’s not rocket science, and it can prevent major accidents. No explanation is necessary because this one speaks for itself. 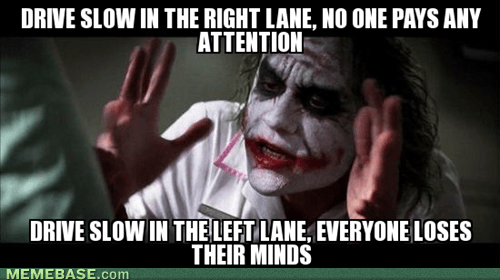 I included this one because a) it’s the Joker, and b) this is also on my list of the 10 Most Annoying Driving Habits (https://www.1statlantaduischool.com/10-annoying-driving-habits/). The left lane is the passing lane ONLY so you shouldn’t drive slowly in it anyways, but Georgia highways have signs everywhere reminding slower traffic to keep left. This thought goes through my head daily, and I’m sure most of you can relate! I hope you found my top 10 list to be as funny as I found it. Some of these were so accurate and applicable to our defensive driving curriculum that I’m tempted to have my instructors include them in their teaching! If you’re interested on taking our defensive driving class with our new and improved meme-filled curriculum to keep you entertained, we can definitely help you! Click here for more information. 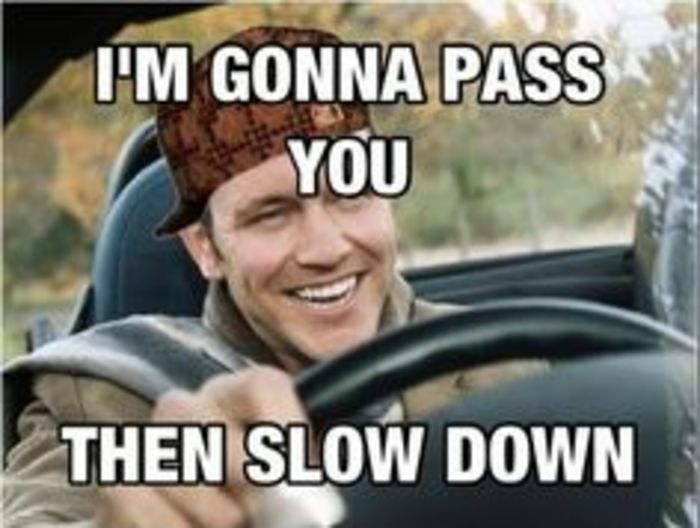 If you’re interested in learning how to drive to avoid becoming one of these memes, we’re more than happy to teach you how to drive. Click here for more information. 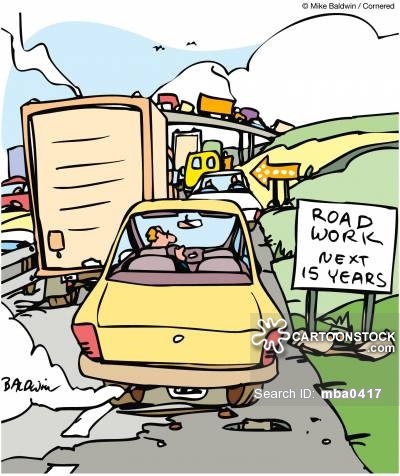 As always, we hope you enjoyed this brief post and can promise we’ll continue bringing driving humor into your life! After all, traffic school is boring, so we might as well try and make it entertaining. You know those lit-up highway signs that typically tell you the estimated length of time it will take to travel on that highway or a bland reminder to keep your seatbelt buckled? Do you actually pay attention to what those highway signs are saying? Don't worry--I don't either unless I need to figure out how long it will take to get to work or something catches my eye. Many departments of transportation realize this, and spiced up some local road signs with eye-catching phrases that will *hopefully* encourage drivers to drive safely and follow our traffic laws. 1 ACT Driving Schools ranked our top 10 favorite highway signs and created this list so that you could enjoy them too! Humans have a seemingly inherent desire to be liked and be accepted into society, typically wanting to be considered "cool" by the in-group. This city tries to appeal to this desire, letting drivers know that it would be "cool" if they used their blinkers. Maybe the innocent high school freshman within us will remember to use their blinker so that the "popular" drivers think they're cool! Before you can understand this highway sign, you need to understand its context. This sign is in Colorado, which (a) is the "Mile High" state because of its high altitude and (b) has legal marijuana, making the state even higher (bad joke, I know...but no one pays me to write jokes!) 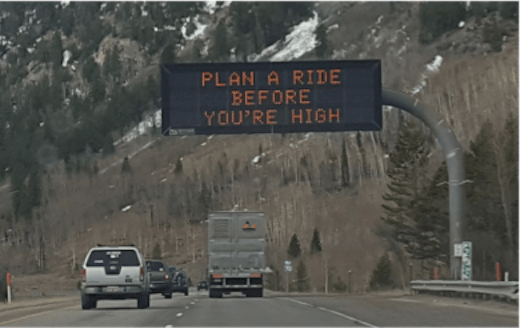 This sign in the mile-high, weed-high state tells people in a catchy slant rhyme to "plan a ride before you're high" as the driver goes higher up into the mountains to remind marijuana users to find a designated driver so as not to drive under the influence of marijuana. Hopefully, people are drawn in by the catchy rhyme tied to the word "high" and avoid driving while high! It's typically ALWAYS easy to convince someone to do something by attaching the task with a compliment--people tend to be more willing to do things for people who shower them with compliments. 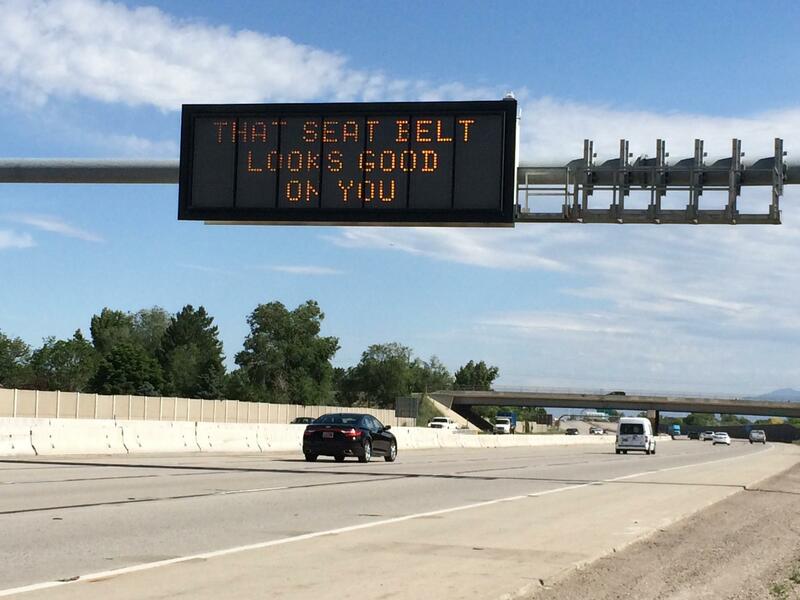 This highway sign compliments the driver by saying their seatbelt looks good on them, ideally making the driver want to keep wearing their seatbelt to continue looking good! Looking good is one of the most important things in life, a close second to safety. Might as well lump safety and good looks together to achieve results! # 7: What's holding you back? Like #8, this highway sign addresses wearing your seatbelt, but this one takes a different tactic. This one uses both an existential question AND a play on words to cleverly trick the driver into wearing their seatbelt (if all goes well). First, it asks the driver why they are not buckled, suggesting that there is some unknown factor holding them back from not using their seatbelt. Second, it uses a play on words--the question "what's holding you back?" not only asks some deep question, but refers to the seatbelt that the driver *should* be wearing to literally hold them back. The hope behind this sign is that the driver will chuckle, then buckle up because they realize that, both figuratively and literally, nothing is holding them back. 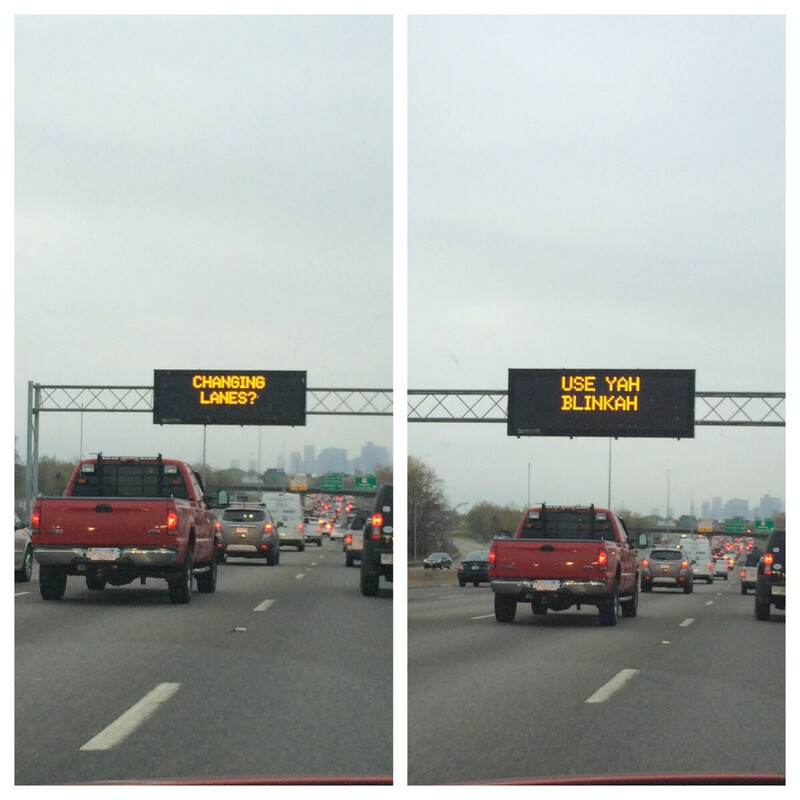 This Boston highway sign incorporates the stereotypical Boston accent with the stereotypical Boston attitude and directly tells drivers to use their blinkers. Rather than using a clever saying, it aims to create a sense of familiarity with the driver by using the beloved accent the Boston driver knows and loves and demands that the driver uses their blinker. Of course, a sign like this might be shocking to the Southern driver who is not used to road signs telling them what to do. 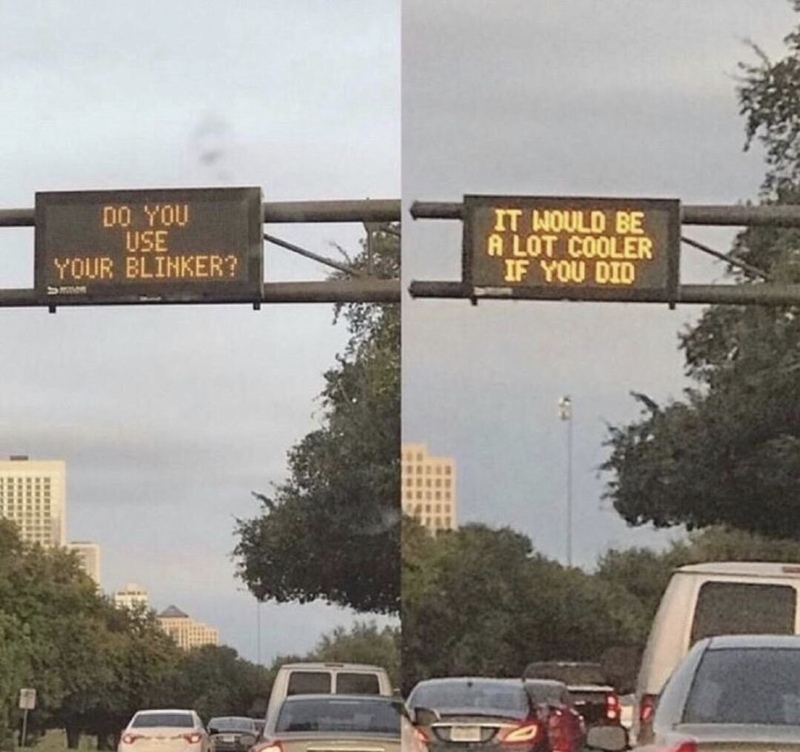 As a Southerner myself, I can tell you that I found this sign to be quite hilarious, and would laugh and change lanes using my blinker the second I saw this sign. You're allowed to take points on me for using the same play-on-words two times in a row, don't worry. I just did it to accentuate the theme between highway signs #5 and 6 (okay, it appears that I have lost all sense of creativity, so just go with it). 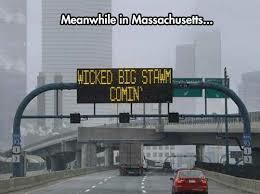 In the south, our highway signs tell us to stay off of the roads when the weather gets rough, but this sign from Boston again uses the familiar Boston accent to *hilariously* inform drivers that a storm is on the way. Maybe drivers are supposed to use this as a warning to stay off the roads--who knows? It seems like this sign's only purpose is to keep drivers informed, then let the drivers make their own decisions. Either way, this particular sign would cause me to stay off of the highway, simply because I could not stop laughing at the alleged size of the storm headed my way. 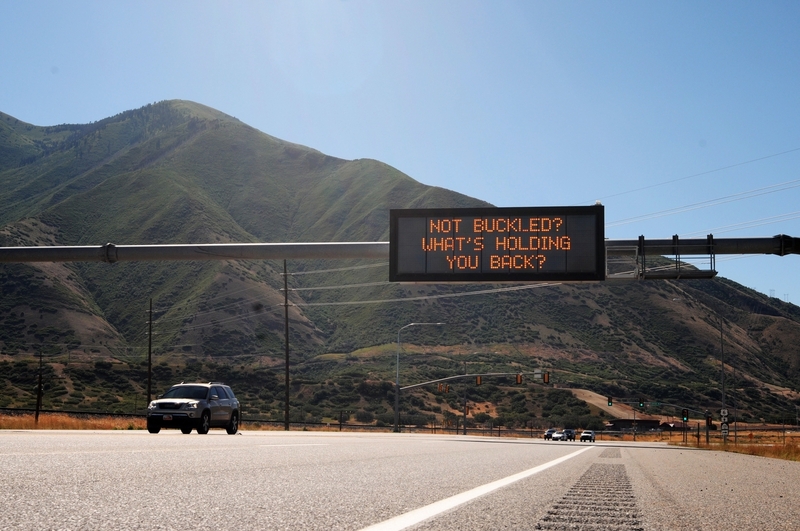 This Utah highway sign caused quite a stir with it's particular play-on-words, as some found it to be offensive. 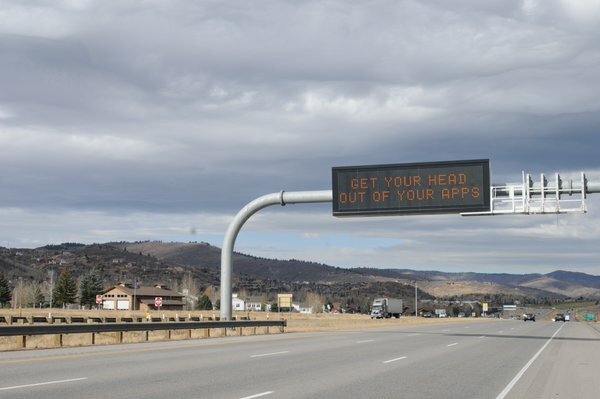 The sign demands that drivers stay out of their phone by saying that they should "get [their] heads out of [their] apps," a clever play on the phrase "get your head out of your *insert place where the sun don't shine*". Of course, many were offended by this sign, but I think it was hilarious and serves its purpose in ordering drivers to stay off of their phones! Looking for some dating advice? Look no further than your Arizona highway signs! 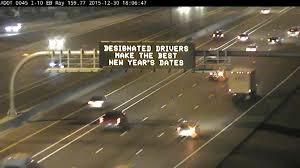 This helpful highway sign informs drivers they should pick designated drivers as their dates. Why? So they don't have to worry about how they're getting home after a night of drinking! The best dates are the ones that want to keep you safe and make sure you make good decisions. This is generally good life advice, reiterated by this highway sign to ensure that local drivers avoid driving under the influence. Instead, we should surround ourselves with people who don't drink and drive, and who will help us get home when we drink so we can avoid getting behind the wheel of our cars! The great state of Arizona, back at it again with the hilarious highway signs! 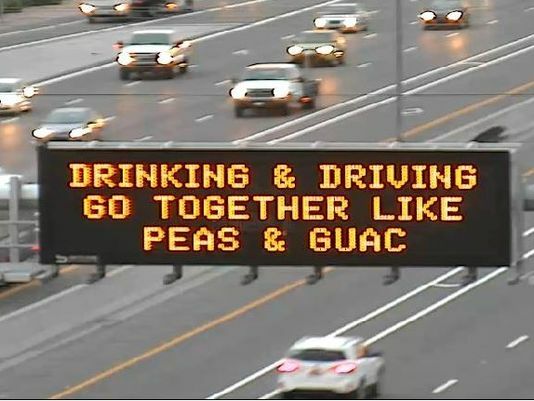 This sign compares drinking and driving to an edible combination: peas and guacamole. The only issue here is that peas and guacamole are a DISGUSTING combination...just like drinking and driving! This sign intends to point out how awful drinking and driving actually is. We should handle drinking and driving the same way we handle eating peas and guacamole--we avoid it AT ALL COSTS! Have you ever wondered why cats don't wear seat belts when they ride in cars? Well, the main reason is that cats aren't often in cars. The other reason is that they have nine lives, so it'll be okay if they die in a car crash or two (note: I know this is NOT true, but just go with it). Humans are not so lucky--if we die in a car crash, we don't get a do-over. The number one highway sign that we found is from Kentucky, and points this out to drivers everywhere. 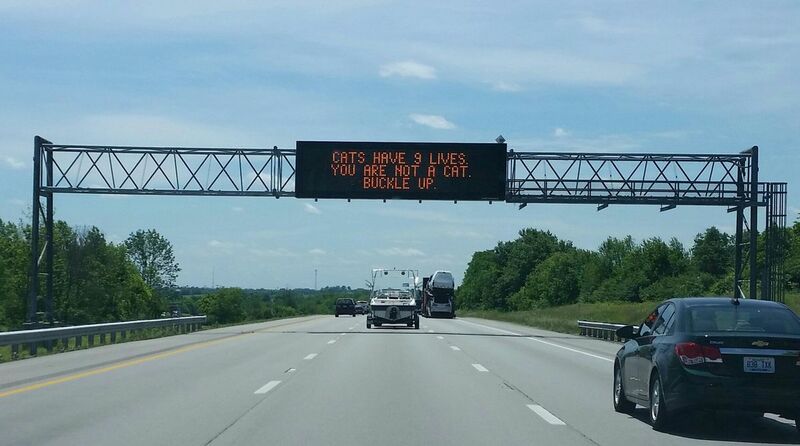 Unlike cats, we don't have nine lives and should buckle our seat belts to preserve that life. Not only is this funny, it also illustrates a very important point about our safety, and we should make sure to stay buckled up any time we are in a car to preserve the single life that we humans are granted. If you feel like your city is lacking in the highway sign department after reading this list, contact your local department of transportation. But really, maybe all of our cities would benefit from these eye-catching, entertaining signs. Humans respond well to things we like, so maybe we'll be more likely to follow traffic laws and drive safely when these signs remind us in a funny way! Either way, here's your friendly driving school reminder to ALWAYS follow traffic laws and drive safely and defensively for the safety of yourself and the drivers around you. Don't worry though--if you broke a traffic law by mistake (and we all do), we're here to help you with that ticket. If you have a traffic ticket, points on your license, or simply want a refresher on your Georgia driving laws (and an insurance reduction! ), give us a call at (770) 274-4223, shoot us a text at (678) 541-8538, or go to our website here for more information. We're always more than happy to assist you with anything. What is the legal limit for Georgia? Did you know that the legal limit for alcohol is different depending on age? If you are over the ages of 21, then the BAC (Blood Alcohol Content) allowed for operating a vehicle should be below .08. However, if you are under 21, that limit changes to .02! If it’s your first offense, you could face jail time from 24 hours up until a full year with fines anywhere between $300 and $1000. Not to mention your license could be revoked for up to a year. Second offenders face up to 3 days to 1 year in jail with fines starting at $600 and ending up to $1000. Third offenses can land you in jail for 15 days or even up to a year. A third offense can suspend your license for up for 5 years. Lastly, your fourth offense likely means one to five years in jail, fines of up to $5000 and your license suspended indefinitely! Unfortunately, there isn’t a definite answer for how many drinks it takes to reach the legal limit in Georgia. It all depends on weight, body fat percentage and length of time in between drinks. Now you may be wondering what you should do if you’re caught in a situation where you’ve been out for drinks and need to get home. Your safest bet is to call an Uber and pick up your car later because it’s super easy to get arrested for DUI with the legal limit so low and you don’t want to hurt anyone else or yourself. When in doubt, call a cab or a friend to come get you. You’ll be happy you did. If you need information on Georgia’s DUI class, we’re more than happy to help! Visit our website here for information, or call us at 770-274-4223 to speak with a representative directly. We know being in the situation where you may need a DUI class isn’t ideal, so we’ll help you get through this experience to the best of our ability. When I wrote that piece, I could only see the benefits of the new law. I mean, ignition interlock devices only help save lives. They literally prevent people from driving under the influence. Unfortunately, anything that distracts people while they're driving can be harmful. The way the ignition interlock device works is quite simple: you give a breath sample, and if any amount of alcohol higher than the legal limit is detected on the breath, the vehicle won't start. When the vehicle is moving, the device will require random breath samples (aka "rolling samples") to ensure that the driver is not under the influence. It will signal the driver to stop if they blow above the legal limit (for more information on the ignition interlock device, click here). Ideally, the driver will pull over to give the rolling sample, but this is not always the case. This means that the driver's attention is divided between the device and the road. This can have fatal consequences, as it did in the case of 18-year-old Alexis Butler. Butler was backing her car out of her driveway when a 31-year-old unidentified driver plowed into her car, killing her. The driver of the other car never tried to slow down, as he was distracted by his ignition interlock device. He was attempting to give a rolling sample and was not paying attention to the road, endangering his own life and taking Butler's. I'm sharing this story with you to stress the importance of being responsible with your ignition interlock device. Yes, the device gave you freedom after your DUI charge, and that's great. However, it's still a HUGE responsibility, as it has the potential to distract you from driving. If you opt for the ignition interlock limited permit, that's great! Just make sure to pull over for your rolling samples and avoid playing with the ignition interlock device while you're driving. Enjoy your freedom, but stay safe while you do it. For the full news story mentioned above, click here. Here's a few mini drunk stories to brighten up your day and one to sober up your day. As far as I know, none of these first three stories resulted in a DUI but that doesn't mean they couldn't have! In Loganville, Ga, a couple was arrested outside of a Waffle House for public intoxication and for getting busy (SHOCKER!) inside their parked car. The woman was so drunk she tried to put a cheeseburger on her foot as a shoe. In Australia, there was a man who, after getting kicked out of the pub, decided to go to the zoo. Once there, he felt compelled to ride one of the alligators. This man jumped into the enclosure and attempted to ride one. Unfortunately for him, the gator wasn’t too happy about it and took out a large hunk of his leg. Luckily, none of these people were driving a vehicle while under the influence of alcohol. It’s easy to see with these short stories above how alcohol can affect your impairment. I certainly would be embarrassed if I were so drunk I thought wearing a hamburger on my foot constituted as footwear. We all make mistakes, however, and many people who are intoxicated get behind the wheel and drive, sometimes resulting in a DUI and sometimes resulting in even worse like an accident or death. Not only are you putting yourself in danger but also the people around you. I'd like to end on this note. Here's a story of a woman who got behind the wheel and ended up with a DUI and a smashed up car. Thankfully no one was injured. Josette Young, a Kansas City police officer, was arrested and charged with a DUI while driving her unmarked police car. (OMG) Witnesses say they say Young cross over the median, skid through the lanes going in the opposite direction and crash to a stop on the shoulder. When police arrived, they tried to perform a field sobriety test on Young; she reportedly closed her eyes and refused to follow officer’s commands. She also refused to answer when asked if she understood her Miranda rights. DUIs are a serious thing but we promise that if you’re court-ordered to take a DUI course, we’ll take good care of you and we may even have some fun along the way. So call us today or click here to set up your course at 1 ACT Driving Schools. most parents in the US spend 40 hours or more supervising their child as they practice their driving skills in preparation for getting a license. While most parents teach their children the basics such as parking, making turns, and merging into traffic, it’s also important to teach teens how to drive safely. In a research by the Centers for Disease Control and Prevention, it was found that six teens ages 16 to 19 die every day from motor vehicle injuries. To protect your child against car crashes, there are certain things that he needs to know before he goes on the road. Here are 5 ways to teach your teen to drive safely. It may be convenient to teach your child how to pull out of the driveway and just drive on his very first day of practice driving, but it’s better to let him start slow. With your teen riding shotgun, head to an empty parking lot, then switch places. Teach your child how to adjust his mirrors, start, stop, and turn. You should also remind him to place his hands at the 3 o’clock and 9 o’clock position on the wheel and to relax his arms while driving. Once he masters these skills, you can head out to a spacious area with fewer cars before moving on to streets with heavy traffic. One of the best ways to teach your teen to drive safely and confidently is to let him master certain routes. If he’s using the car to get to school and work, then let him master those routes. Having a built-in instinct while he’s behind the wheel lessens the risks of getting into serious accidents. You may also want to teach your teen to master an alternate route in case of an emergency. Staying focused means keeping his smartphone out of reach and not doing anything else while he’s behind the wheel. This means no texting, answering phone calls, or taking selfies while he’s driving. Remind your child to turn off his phone and keep it in the glove compartment for the duration of his trip. To keep your teen safe, have him practice at different times and in all types of weather. Night time driving requires more focus and presence of mind than daytime driving, so allow your child to practice during the evening and even late at night during the weekends. If your teen’s skill has improved, let him practice driving in the rain and snow. Oftentimes, first-time drivers panic when faced with scary driving situations, and this leads to accidents and car crashes. Remind your child to stay calm and have a plan of action in case he gets into any frightening situations while he’s on the road. For instance, if someone is tailgating him, the best thing to do is to pull over and let the other driver pass. During a yellow light, remind your teen to use his best judgment before taking a course of action. And if he ever feels like he’s being followed, tell your teen to head to a highly populated area, stop, and make a phone call to the police. Children grow up fast, and while we can’t stop them from exploring the world, we can keep them safe while they’re on the road. Follow these tips to teach your teen to drive safely and instill good driving habits that he’ll use for years to come. This post was derived from a longer piece co-written by the author of this post, Jackie Edwards. For the original post, click here. Now working as a writer, Jackie Edwards started her career in finance and banking, but after becoming a mom refocused and decided to spend more time with her family. When she's not writing, she volunteers for a number of local mental health charities and also has a menagerie of pets to look after. Note: If your teen in Georgia wants to get their driver's license at the age of 16, they will need to complete the Joshua's law requirements of the 30 hour driver's education class and 6 hours of behind the wheel driving lessons with a certified driving school. For more information on driving lessons or teen driving packages with 1 ACT Driving Schools, click the links below. As we all know, DUI charges are NO laughing matter--however, occasionally the news reports a very funny DUI story. 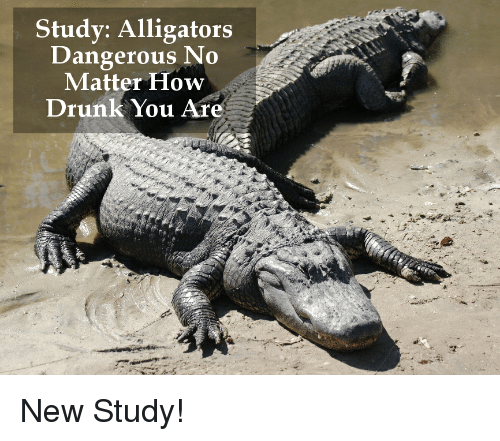 I know we all get tired of hearing about the depressing DUI accident stories, so I decided to look around for some of the more entertaining stories (where no one gets hurt, of course!) I decided to look up some funny DUI stories for my own entertainment, and compiled a list of my favorites to share with you. Here are the TOP 10 funniest DUI stories, as told by 1 ACT Driving Schools. 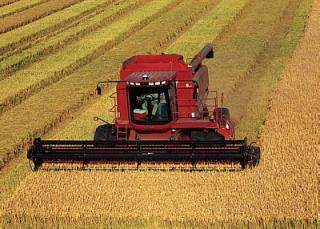 Have you ever seen those GIANT machines farmers use to harvest their crops? They're called combines, and look like the machine in the picture to the right. A man in Pennsylvania decided to drive a combine while intoxicated, hit a mailbox, and got arrested by police after he passed out in a bean field. He faced charges of driving under the influence and hit and run. For some reason, men seem to enjoy riding large farming/lawn equipment while under the influence. A Minnesota man received his NINTH driving while intoxicated (DWI) charge while driving his lawnmower with a blood alcohol concentration of 0.28. He already lost his license to one of his DWI charges, so he figured he would be fine using his lawnmower as his primary mode of transportation. He faced charges of DWI and driving without a license. Fair warning: if you don't have a driver's license, you should probably avoid driving ANYTHING. Again with men driving things that are not cars while drunk! Police pulled a man over in Indiana on Indiana's state road 135 for a few reasons: 1.) driving on the wrong side of the road (heading north in the south bound lanes) and 2.) driving a motorized scooter. You read that right-this man stole one of those motorized scooters you find at Walmart and drove it while drunk on the wrong side of the road! Police didn't question it until they noticed the "in-store use only" sign on the back of the scooter. They pulled the man over and arrested him for driving under the influence and theft. 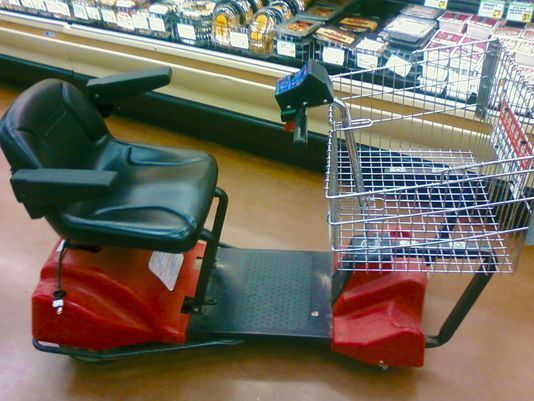 Don't worry--police returned the scooter to Walmart after the arrest. 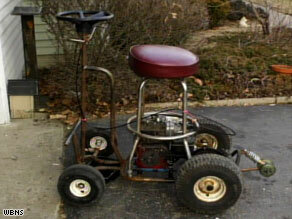 Talk about lazy--a Minnesota man received a DUI for driving his motorized La-Z-Boy chair to and from a local bar. First of all, let's take a second to appreciate the fact that he has a motorized La-Z-Boy. I mean, the thing is CRAZY--it has a lawnmower engine (again with the lawnmowers!) 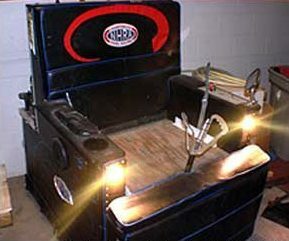 a cup holder, a radio, a headlight, an actual La-Z-Boy chair, and naturally, a National Hot Rod Association sticker. Second of all, the man got a DUI for driving the chair! Police pulled the man over after he drunkenly crashed his chair-car into an actual car. They promptly escorted him to jail and charged him with driving under the influence. Typically when you go to a bar, you go to the bar, sit on the barstools in the bar, then make your way back home. A man in Ohio inserted a barstool into all THREE of those steps as opposed to just the second step. He drove his motorized barstool to the bar, used it there, and drove the barstool home from the bar. The vehicle had a lawnmower engine and steering wheel, four wheels, and of course, a barstool welded to a metal frame. While attempting a U-turn on the way home from the bar, he crashed the stool, drawing police attention. Needless to say, police arrested the man and charged him with DUI. Even though the man admitted to driving after drinking 15 beers, he plead not guilty and is headed to trial. Let's hope he leaves the barstool at home that day! Apparently, Australia has these motorized coolers called "eskies." 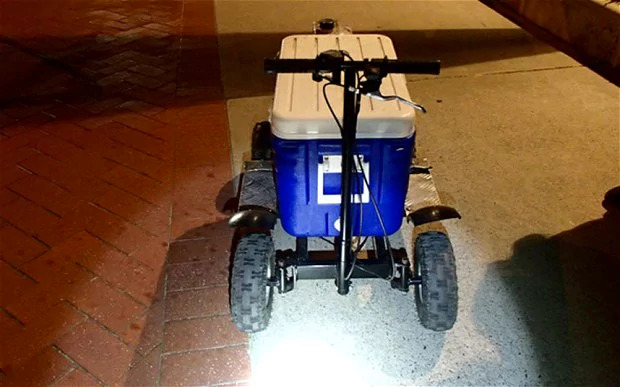 They take a typical drink cooler and add a set of handlebars, wheels, and a motor, creating a convenience mode of drink transportation. Of course, genius inventions don't always work as planned. A man in Perth, Australia, decided to drive his esky at night. This drew police attention, as the coolers don't have proper lighting and are unsafe to drive at night. On top of that, he was driving in a bike-lane, the place you should NEVER drive a motorized vehicle. When police pulled him over, they found that the cooler was filled with beer, wine, and bourbon drinks, leading to him receiving a DUI charge. We all know you can drive UNDER the influence, but who knew you could drive ON TOP of the influence? Before you accuse me of trivializing social movements, the only reason I use this phrase is because of the story. 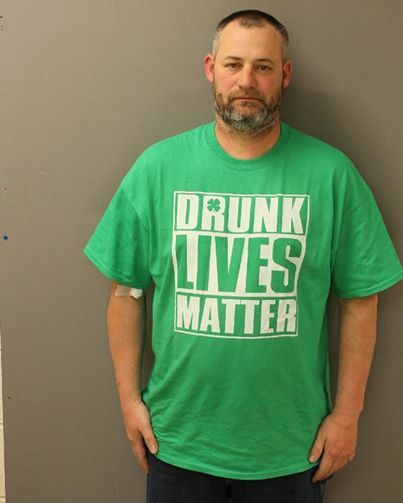 A man in Pennsylvania got a DUI charge while wearing a shirt that said "Drunk Lives Matter." Police pulled him over for multiple traffic violations, suspected that he was under the influence, and transported him to the hospital and arrested him for driving under the influence. His blood alcohol concentration was 0.217! It's quite ironic that he chose to wear that shirt on the day he chose to put his own drunk life in danger. Halloween: the only holiday that notoriously involves costumes and alcohol. One Halloween, a teenager was pulled over for driving erratically. Police immediately knew the teen was drunk, and took him into custody. Upon searching the vehicle, they found open containers of alcohol in the truck as well. Of course, they made sure to include in the report not only that the teen blew more than twice the 0.08 legal limit on the breathalyzer, but that he was also dressed as a breathalyzer. 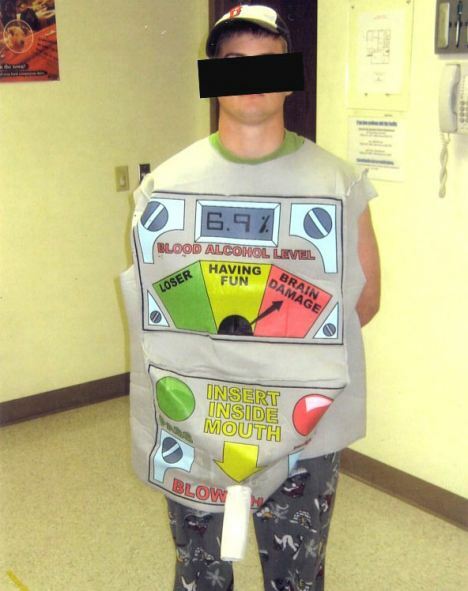 Yes, this young man dressed up as a breathalyzer for Halloween and received a charge of driving under the influence. I wonder if he dressed up as an ignition interlock the day he got the device installed in his car! #2: Come on Barbie, let's go party! A man in Essex, England was pulled over for driving one of those motorize pink Barbie cars designed for 3-5 year olds while drunk. He and his son put bigger wheels on the car, so of course he had to take it for a spin! Unfortunately, his blood contained more than twice the legal limit of alcohol, and he was arrested for driving under the influence. He later admitted to being a "complete twit" for cramming his adult body into a child's car and driving it. He lost his driver's license for 3 years (the one for driving actual cars and the one for driving toy cars) and was sentenced to 12 months of probation. I guess he took Barbie's inviting "Barbie Girl" song quite literally and decided to take her car out for a party! That sounds like the start of a really bad joke. Unfortunately for you, it's not a joke! A Colorado man was headed to a family wedding in Utah. 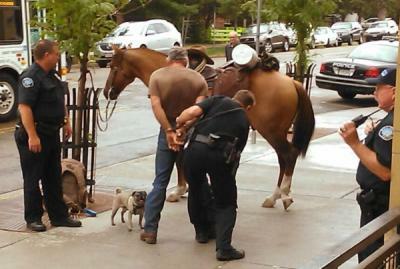 While passing through Boulder, Colorado, the man arrested for riding his horse while drunk. Witnesses told police they saw the man hit the horse (he claimed he was swatting flies away). When police went to investigate, they found the man slumped on the horse's back. He dismounted and failed his field sobriety tests. Police checked the saddle bags to find beer bottles, and checked the man's backpack to find a pug! The man was arrested and taken into custody, but was able to make it to the wedding with his horse and dog in tow. So there it is--the 1 ACT Driving Schools list of the top 10 funny DUI stories for your personal entertainment. Of course, you should remember that DUIs typically are not funny and we should encourage our loved ones to avoid driving under the influence of alcohol, as that can result in serious consequences. If you or a loved one has received a DUI, please click here for information on attending your DUI class with the DUI school that's here to keep you entertained! If you have not received a DUI charge, please make sure to avoid driving under the influence at all costs. Call a cab, request an Uber, find a designated driver, do anything other than driving while intoxicated. Also, remember to avoid riding horses or driving any random object with a motor, because police will pull you over and you could end up on someone else's list of the top 10 funniest DUI stories! Once again, I am here to write about a recent DUI accident near the Atlanta area. Unfortunately, this one is less entertaining than our bus driver DUI post from last week. This week, I’m writing about the worst outcome of driving under the influence. 31-year-old Chick-fil-A manager, Chase Chapman, drove to work last Saturday morning and a man driving under the influence T-boned Chapman at an intersection. The police arrested the man immediately, but unfortunately, this does not undo the damage done to Chase’s life. Chase died during the accident. Chase’s father, Carl E. Chapman, is no stranger to losing someone to a drink driver. He lost his mother to a drunk driver in 1984 in what he said was “almost the exact same kind of incident” (qtd. in O’Brien). He started a GoFundMe to raise money for his grandson (Chase’s son), and has currently raised over $27,000. Oh yeah—Chase had a 6-year-old son. This sweet, six year old boy lost his father in one of the worst ways possible. According to Chapman, Chase’s Howell Mill Chick-fil-A family sincerely misses Chase, as do their regular customers. Chase provided a light in the lives of many, and the world will not be as bright of a place without him. This Friday kicks off Labor Day weekend. We know this weekend will be filled with cookouts, parties, family, and plenty of alcohol. Everyone here at 1 ACT Driving Schools asks you to be aware of your state when you leave your festivities and do not drive under the influence. You may have a fun day and not have a care in the world, but your decisions could take a life this weekend. Pick a designated driver, call an Uber, or simply don’t drink. Whatever you do, please make the decision to drive sober, and safely enjoy your holiday weekend. We wish you a safe Labor Day weekend, and hope you remain aware of your decisions throughout the holiday festivities. For original source, click here. As a DUI school, we always try and keep up with the newsworthy DUI stories in our area. Recently, a story crossed our paths that not only made the local news, but made the NATIONAL news as well! This story is so big, it’s the size of a school bus. Actually, it involves a school bus. On Monday, police pulled over a school bus driver in Walton County near Loganville Middle School for driving erratically. The police removed her from the school bus and administered the field sobriety test, which she failed immediately and went straight to the Walton County Jail. During her booking, they recovered half of a bottle of tequila, four mini bottles of vodka, and four bottles of prescription pills in her purse. She posted her $25,762 bail only a few hours later, and left the jail. She Walton County School District fired her immediately afterwards. The city is charging her with a DUI (obviously) as well as 16 counts of child endangerment. 31 children were present on bus, but only 16 of them were under the age of 14. The bus driver has no priors, but was fired from the Gwinnett County school district just months before for “unsatisfactory performance” on the job. Not only did she lose her job, she will have to pay a RIDICULOUS amount of money. Since this is her first DUI, under the new ignition interlock laws, she will need an ignition interlock device installed in her car. This constitutes a $100 installation and removal fee as well as monthly calibration/maintenance fees. 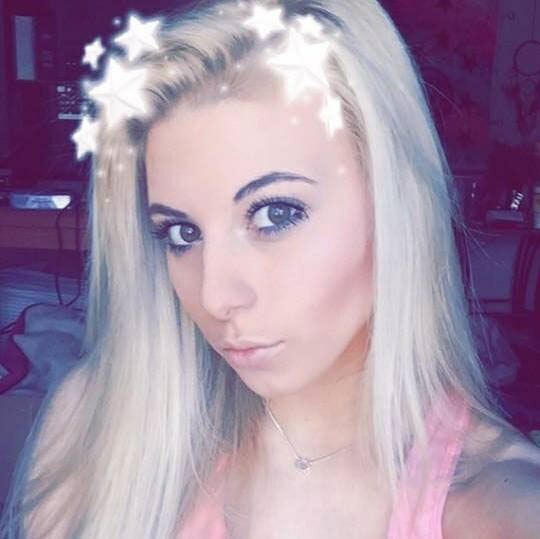 She will pay $25 to the Georgia Department of Driver Services to have her license reinstated. A decent lawyer will require a $3000 retainer fee. She will have court fines. 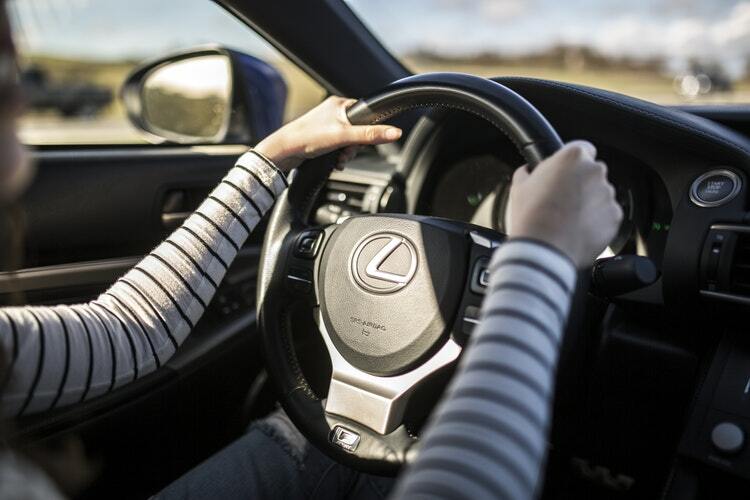 She will be required to take the $355 risk reduction class, offered at 1 ACT Driving Schools. Her required clinical evaluation will cost at least $110. Don't forget the bail money that she posted! This woman definitely ruined her career as a bus driver, and her finances. The moral of the story is simple: don’t drink and drive, ESPECIALLY not when you’re driving a school bus with 31 children as your passengers.